Errors in pharmaceutical reordering are documented sources of negligence in the healthcare industry and can lead to patient endangerment and malpractice suits for healthcare facilities, physicians, and pharmaceutical companies. Despite this reality, many healthcare environments still use a traditional reordering system. Traditional reordering occurs when a nurse discovers a patient’s medication is below a specific level, pulls off the reorder sticker and then faxes the sticker to a pharmacy. These stickers not only ‘gum up’ the customer’s fax machine, but transmit unclear information to the Medicine Centre’s pharmaceutical staff. 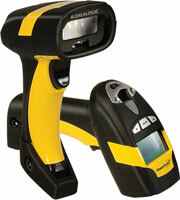 After experimenting with different long range wireless bar code scanners, Funk selected a product from Datalogic Scanning’s Powerscan family, a line of premium rugged industrial handheld scanners. The scanner was chosen because of its sufficient wireless range, which was able to communicate with a personal computer more than 200 feet away and around several corners. The Powerscan family of products also features the patented Green spot technology for good read confirmation, which is ideal in healthcare environments as the Powerscan reader can be silenced when used around sleeping patients. As an industrial family, all Powerscan products are made with enhanced durability. During testing, the Medical Centre adopted a system where each prescription container was labeled with a bar code containing only the prescription number to protect HIPPA laws. When the prescription reached a specified low level, the nurse scanned the bar code and the information was transmitted to the nurse’s station and the Medicine Centre instantaneously. After only one month, the testing was deemed a success and the Medicine Centre purchased the Powerscan readers. They even expanded their scanner usage to include Datalogic’s Gryphon scanners for their smaller customers. The new prescription reordering system has created benefits that both the Medicine Centre and its customers enjoy today. The selection of the Powerscan readers has not only eliminated frustrations and problems with faxing reorders, but has streamlined the entire prescription reordering process. The technology has been readily adopted by the nurses in the long term care facility and has been praised as being ‘innovative’ and ‘time saving’. As a pharmaceutical distributor, the Medicine Centre has been able to use this new system as a unique selling point for potential customers. Funk stated, “It’s a great marketing piece for us and a way to differentiate our business.” In addition, Funk discussed the fact that their ability to meet the diverse needs of each nursing home through the versatility of the product lines from both of Datalogic scanning’s Powerscan and Gryphon product families was key to the project’s long term success.